This adapter gives different magnifications for eyepiece projection photography. The eyepiece itself is inserted after the adapter and the focal ratio can also be adjusted. In order to connect your camera to this adapter, the T-ring is required. This adapter can also be used for prime focus photography without an eyepiece. The Solomark 1.25-Inch Variable Projection Camera Adapter for T-Mount comes with a 1-year limited warranty. Solomark has everything you need to capture the night sky for experienced star-shooters, serious researchers and beginners alike. Serious astronomers for years have flocked to Solomark telescopes for their quality optical systems and patented technology. Adjustable Length Adapter lets you attach a T-Ring Equipped DSLR or SLR Camera Directly to your telescope. Using Solomark 1.25-Inch Variable Projection Camera Adapter, you can not only capture the scenery of moon and planets, but also be adjusted focal ration. Sturdy Aluminum Structure, Brass Screw, can be your partner for a long time. One Year Warranty , Whole Life Technical Free Support. 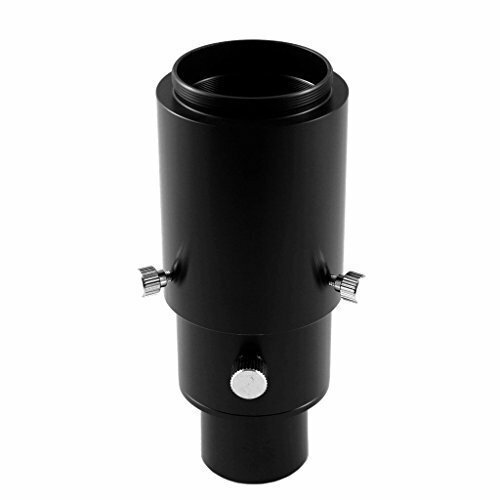 Compatible for both reflector and refractor telescopes with 1.25" eyepiece holders. The 1.25" Variable Universal Camera Adapter is made of black-anodized aluminum.